Chomsky: It’s Hard To Look Into The Mirror. 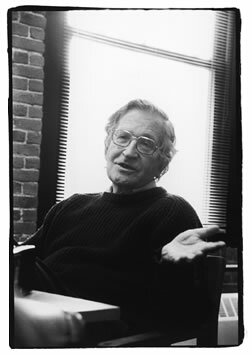 Yesterday I spent some time transcribing the podcast interview I did with Noam Chomsky way back in 2005 for the book I’m working on. If you haven’t heard that episode, I highly recommend having a listen, even through the audio quality leaves a lot to be desired. I hadn’t listened to the full thing myself in many years and it blew me away. It’s as relevant now as it was back then (if not more so). Look into the facts. This isn’t quantum physics, the evidence is easily available if you want to look at it. Actually one of the hardest things to do, whether in personal life or in thinking about international affairs, is just to look into the mirror. We all know this in personal life. It’s much more convenient to have illusions about yourself than to look into the mirror and see yourself honestly. Anyone who doesn’t know that is just lying to themselves. We all know it. We create an image and picture of ourselves which fits our need to believe that what we are doing is basically benign and helpful and forthcoming and sympathetic and sometimes it’s true but often it isn’t and when it isn’t we typically finds ways of explaining it away. But if we are honest we will look into the mirror and see what the truth is and do something about it. And the same is true when you look at international affairs. Now there’s a difference in this case. When it’s a matter of just yourself, when it’s just a matter of how you deal with it, when you try to look honestly at your own society, its history and actions and so on, you’re facing a massive deluge of propaganda and indoctrination that is trying to create a delusionary picture. So power systems are naturally conspiratorial, naturally they are going to dedicate enormous efforts to try to get the population to view the exercise of power and hierarchy and authority as if its benign and full of benign intentions. I don’t know an exception to that in history. If you read the pronouncements of even the worst monsters, Hitler, Stalin, Mao, Hirohito, they are all full of the most eloquent rhetoric about their noble intentions and how they are sacrificing themselves for the benefit of the people and so on and so forth, and yes major institutions are developed to try to promulgate those ideas and in fact its true that in the countries most people believe them. So for example in Nazi Germany, until it began suffering serious military defeats, Hitler was very popular, maybe the most popular leader in German history and his conception of the nobility of their engagement in the world and domestically, that was widely accepted. Same in fascist Japan, same in Stalinist Russia. That happens and it also happens in more free societies. Furthermore, there is nothing novel about it. Centuries ago, David Hume had an important work on political philosophy called “Foundations of The Theory of Government”. His first principle of the foundation of government he pointed out that power is actually in any society, he said, power is in the hands of those who are governed. They don’t know it, but power is actually in their hands. And therefore to maintain authority it is necessary to impose consent, it is necessary to compel the general population to consent to the authority of the masters. And he said that’s true in every society, from the most free to the most despotic. And that’s basically correct. And anyone with any degree of authority knows it, whether it’s in a family or school or corporation or government or World Bank, you know that, you have to compel consent somehow and to do that we now have massive institutions, huge institutions, media, educational systems, huge public relations industries, which are, to a large extent, devoted to this. If you want to discover the truth about your own society, its history and workings and so on, you do have to overcome barriers, barriers which are erected to prevent such understanding, but it’s not very difficult, again, it’s not quantum physics.